Alma B. 's whimsical artwork features doe-eyed girls with flowers in their hair and pod-like botanicals nestled amongst cosy villages. Her signature character Alba is a young girl with a special connection to flowers and speaks to them in their own flower language. Growing up, Alma B. loved the characters and native flora of May Gibbs' stories, which is reflected in the special bond that her own characters have with the environment around them. Artist and graphic designer Alma B. is based in Brisbane where she paints her dreamy artwork. She also designs jewellery and accessories using her designs including necklaces, brooches and mirrors. 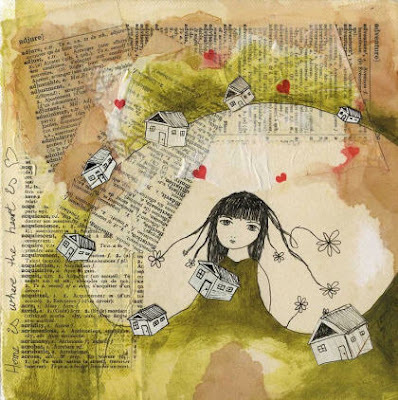 Her art takes me away to another world, and I love the use of book pages and printed paper in the mixed media pieces. You can view more of Alma B. 's art in the gallery on her Website, where you can also purchase prints, jewellery and accessories. Prints and original artwork are also available on Etsy. There are a list of other stockists on Alma B. 's Trunkt profile. You can also delve a little deeper into Alma B. 's world through her blog. I hope you enjoy exploring Alma B. 's artwork as much as I have. Image: Home Is Where The Heart Is by Alma B. This is such beautiful collage work! - thanks for the link! Hi Alarna, so glad you like. Did you see the valentine's day love notes? That's the one! Super cute as jewellery too.